My human has a game she plays with me. She tosses one of my current favorite treats into a box. You probably know what happens next. If I did not know better, I would think the whole point of this game was to get photos of me in motion. Of course, after a while all this fun drew a crowd. My human got rid of Binga by tossing a treat far, far away. Boodie, for some reason, did not follow. In fact, a while later, hours after the game was over, my human found Boodie, being a copycat and sitting in the box. I think she expected a treat to magically appear there. Does your human think up any fun games for you? I’d love it if you told me about some of them in the comments! Aw Boodie, you are seriously cute! I love the idea of magically appearing treats!! We LOVED your rollover comments on these photos, too. 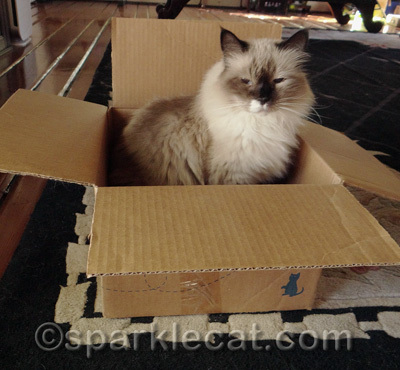 No enticement needed over here – Maxwell OWNS the whole “box” thing. 😀 My mom makes box house for us with little doors so we can run right through them or hide and jump out of! Hi I just wanted to let you know that I have nominated your blog for the “One Lovely Blog Award”! For more information visit foxymblog.blogspot.ca post of Oct 12, 2013. Congratulations! Box games are great fun. Once, we had a box that was so big my mom got in it! I thought that was a little strange and didn’t know what to do. Glogirly was making Waffles leap into a big box with the red dot tonight! It was quite a scene. Surely Boodie “found” a treat in that box? We like to play with our fishy pole with a tissue paper worm! Very good Sparkle! My human throws my favourite toy to the other side of the room and then she runs away so I can’t find her! She’s weird! I will never understand you cats and your boxes. They are for EATING not sitting! That looked like a fun game as long as the treats kept coming. Boodie made us giggle! We play the same game only we use toys. Never thought of treats. Good idea. Garfield loves when my son blows on him or chases him. Sometimes he will play fetch. The others love any kind of string toy or feathers. Loupi : I love to play “catch me if you can” in the garden with Mum. She says I’m cheating every time I climb on a tree ! Well, imitation is the sincerest form of flattery, Sparkle. I guess Boodie recognizes your wisdom … hope she got a treat after that long wait. Awww!!!! Boodie is super dooper cute, and of course so are you Sparkle! Some times we get magical sticks popping out from under our favorite sleeping spots. It’s impossible to catch the darn thing! You know what my fave game is: rockets!! 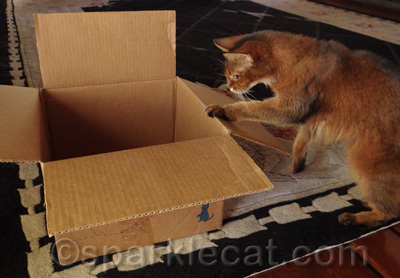 When TW has a box, she usually tosses the current fave cat toy into it. Mostly, I could care less. I also love to play tag and have TW chase me through all my tunnels. 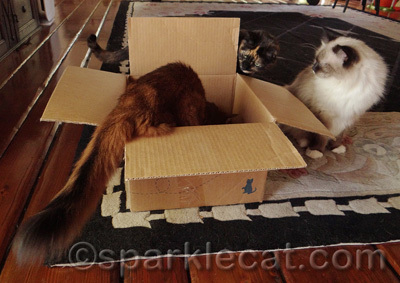 Oh Sparkle we haven’t seen your tail before, it’s gorgeous! 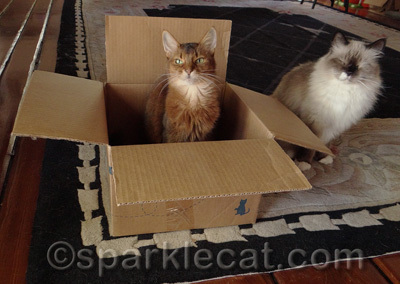 We love Boodie’s face as she sits in the box. Human and Buster play catch the red dot every night. Emma sometimes play too. SPARKLE A NICE HUMAN..YOU HAVE FUN AND SHE HAS FUN TOO! OMCs SPARKLE YOU HAVE A MOST LONG ANS LUXURIOUS FLUFFY TAIL…. Hope beautiful Boodie got a treat…Our Mom gives us blanket mice from time to time…you never know when they will sneak into the house…She will throw treats so we have to chase after them and we have to be really quick because with seven of us there is a lot of competition! We have lots of toys but she should rotate them more often…and playtime should last longer but Mom is old and slow and tired…she naps more than we do…She takes a nap to recover from her previous nap! Well, if finding a hidden stash of weatherstripping is a game, I totally win! I don’t think my mom thinks so, though. Mom is always moving our stuff around so we don’t get bored. Plus she rotates our toys so it’s like Christmas morning every few days! The lady with the yellow hair will hide some of my favorite mousies under the blanket on the bed so I hafta go in and look for them. Our Mom hides treats in things to get better photos. Yeah….right….like that’s going to help!! The best game that we play is who can win the race to the kitchen. The six cats or the Person. Every time she stands up, it is a race to the kitchen and believe me, us kitties win every time. She does need to think up some more games for us. Take care. The woman plays a great game with us. It’s called stair trip. The object of the game is for us to try and trip the woman while she’s going either up or down the stairs. We get extra points if she’s carrying something. Sometimes we try to get a two for one when she’s carrying the sticky person. We love a good box too but our Mum is stingy we don’t get nip in it! Our head peep tried something similar recently, but she made the mistake of putting catnip in the box to try to get Pierre inside. 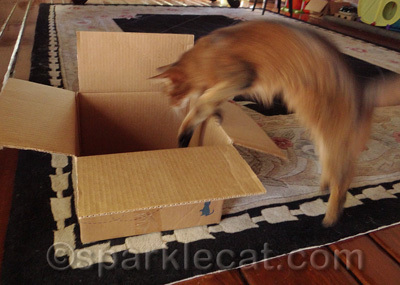 Epic box smackdown. Glad you at least got to sit in the box by yourself! We luff how Boodie always does her own thing. Here, we mostly watch Leia do things like chase her tail…. that’s always fun. We love boxes with mommy’s stuff in it! She moves Vashti’s little pink bear around the house fur her to find. I love a good box and I must say that Brodie looks very happy occupying the box.